www.bayviewhotelni.com – Race sponsors from year one, Trevor Kane and the Bayview Hotel has sponsored a race every year until 2018 when The Bayview Hotel became the Road Races Title Sponsors for the Race of Legends. The Bayview Hotel sits proudly in one of Northern Ireland’s most stunning settings, overlooking the ever changing Atlantic Ocean in the picturesque harbour village of Portballintrae, one mile from Bushmills on the famous North Antrim Coast Road. An avalanche of culture awaits you on our doorstep such as the mythical Giant’s Causeway, Old Bushmills Distillery & Dunluce Castle. www.marinehotelballycastle.com – Ballycastles Premier Hotel, situated on the harbour front overlooking Rathlin Island and Scotland. Contact Claire for special Armoy Road Race Deals and Offers for Spectators and Competitors. www.carnatelylodge.com – Bed & Breakfast house, located conveniently between Armoy and Ballycastle. www.fullertonarms.com – Guest Inn in Ballintoy, very near carrick-a-rede rope bridge. www.islandcorr.com – newly opened Farmhouse B&B near Bushmills and the Bushmills Distillery. www.airbnb.co.uk/rooms/5017199 – New built, large (4 bed) self catering bungalow that sleeps 7. Only 1 mile from Church Bends. The Archway – Nice compact self catering home with one double bedroom and shower room, kitchen/dining and sitting room with Sofa bed to sleep 2 people. Only 4 miles from the Armoy course. Contact Robert Mccaw on 028 207 51651 MOB: 077 638 44548 or Email: [email protected] for more details and availability. 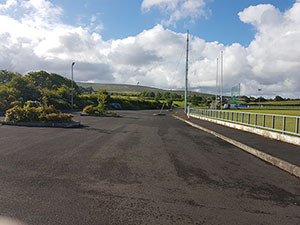 New for 2018 – Camping & Camper Van facilities are now available at Armoy GAA Club. 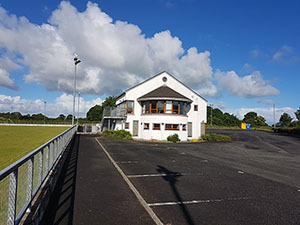 The Glen Rovers Club has agreed to allow Camping & Motorhome accommodation as well as opening the Ladies & Mens Toilets, Changing Rooms and Heated Showers etc for the duration of the Armoy Race Week. Ballyvoy Camping Barn is situated just outside Ballycastle and is an ideal base to discover all the North that Northern Ireland has to offer. Set in the village of Ballyvoy, opposite ‘Hunters Bar & Restaurant’ this new build camping barn offers superb facilities that include ensuite, HD Tv’s, secure parking, bike shed, picnic area, snacks & cool drinks vending machines and a disabled room with full facilities. For more information contact [email protected], Telephone 0772 5588 595 or visit www.ballyvoycampingbarn.com for availability and booking.